I’ve been lurking for a while trying to gather information on purchasing my first stick burner and was hoping someone had some hands-on experience with the two models I’ve narrowed my search down to: The Yoder Loaded Wichita and the Horizon 20” RD Special Marshall. Little about me: I’ve been making BBQ for about 8 years now using both a Cabela’s Masterbuilt Barrel Smoker and my Weber Summit Grill with a Smoker Box. 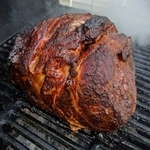 While both have created great meals, The Barrel Smoker is about worn out (temperamental heating element) and the Weber has issues holding a low and slow temperature. For these reasons, I’m looking to upgrade to a true offset BBQ rig. I’ve had the opportunity to see both in person, so looking for some advice from someone that has had hands on experience cooking with both. From what I have gathered from other threads, the Yoder Loaded Wichita is a quality rig aesthetically with great welds, but can suffers from some air flow issues via slamkeys posts on the topic . I live in Denver and due to the high altitude and thin dry air, burn through a TON of charcoal any time I fire up my Weber kettle. I’m worried that the altitude plus having to leave the side door open through the entire cook is going to make me go through a pile of charcoal and wood any time I’m cooking. In regards to the Horizon, it sounds like it has better airflow, but comes without the 2nd cooking grate and the welding isn’t as ascetically pleasing. Problem is there is much less info online about the unit itself. Does anyone have any advice they can bestow on a future stick burner newbie? I am new to the forum, and I too am interested in the loaded Wichita. My research has led to the questions you've presented, and I'm curious on your decision. I'm also interested in whether @Slamkeys would recommend a loaded Wichita, based on the updated build. Glad you dusted off this thread because I forgot to update with my final decision: I ended up getting the Horizon over the Yoder and will share my honest thoughts on the unit I received, and how it operates at altitude. One piece of information that I think you should know before making a decision is how painfully long it took to get the unit. I ordered the unit in early April, and didn't receive the unit until mid August. Thought the lead-time would only be 6-8 weeks, but it turned out more than double that. Once I received the unit, I've been very happy. Pros of the unit are that it's extremely well built and holds constant temperatures well. Only con I have is the doors aren't the tightest fitting, and I need to spend some time filling the gaps with food grade silicon and gaskets. One potential con is per the instructions in the owners manual, and I have confirmed this through, the unit likes to run blue smoke at 250F. If you want to run at 225F, it may be difficult. I've run minion method with lump and briquettes as well as 100% wood and the results have been the same: 250F is the sweet spot measured by a digital thermometer on the grate. Some of this could be altitude related (in Colorado over 5,000 feet with zero humidity). This is my first offset, so I've ruined meat, made great meat, and had results in between. Overall I'm happy with the unit and am looking forward to refining my skills in the future. Hope this helps. Thank you for the detailed reply. Was your final choice based on not accepting the risk of failure with the Yoder? I must admit there's a 75% chance I go with the Yoder. I don't pretend to speak for him, however given the amount of bad press and majority consensus my question would be "why take a chance" when there are so many other choices. I'm curious as to the attraction... it can't simply be the wheels. If it helps, the two items that helped tipped my decision towards Horizon vs other quality builds were A) shipping from Perry OK to Colorado was a considerable savings versus other manufacturers in other locations, and B) the movable convection plate for heat management. It does do a great job of holding the temperatures constant across the entire cook chamber and gives me an option to move it towards the smokestack if I need a hotter zone by the firebox. I'm coming from a Char-griller 2121, with an added side firebox. I've mastered it, and I could keep going on it. However, I respect that there are better choices. Since the art and skill of smoking meat is a true hobby of mine, I don't mind spending $$$$ for an upgrade. I've always respected the fact that my Char-griller gives me so many options for cooking: smoking, direct grilling on the main cooking barrel or in the side firebox, rotisserie, etc. I was about to settle for the Wrangler, but that led me to the Yoder Wichita. The Wichita will give me everything I want, except for the rotisserie support. My local grilling store has a relationship with Yoder, and I can save on shipping if I include my order with their bulk orders. This is a plus. I also went to Bass Pro to check out the Horizon, but they only had a 16" on display. Even if they had a 20" for me to check out, there is something about the Yoder that pulls me closer. I have never seen one in person, so I can only imagine the quality. I also keep up with All Things BBQ on YouTube, and they are huge on Yoder products (I know their location plays a HUGE roll in the relationship). Overall, I feel the Wichita will meet my expectations and needs. .... 'nuff said. Go for it!! !